Thrustmaster Ferrari 250 GTO - Steering wheel attachmentThe Ferrari 250 GTO Wheel Add-On boasts a metal faceplate and internal structure, an authentic chrome logo plate in the center, plus genuine high-quality wood covering the wheel’s entire circumference with a black ring running through the middle: the resulting design is understated and sleek. All of these carefully-reproduced details transport the user right back to the 1960s. 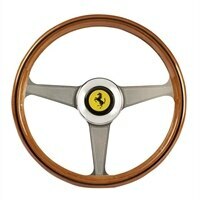 The Ferrari 250 GTO Wheel Add-On boasts a metal faceplate and internal structure, an authentic chrome logo plate in the center, plus genuine high-quality wood covering the wheel’s entire circumference with a black ring running through the middle: the resulting design is understated and sleek. All of these carefully-reproduced details transport the user right back to the 1960s.